Potawatomi Wildlife Park shall be a place where the natural, historical, and cultural features of the area are conserved, protected, and restored for use and enjoyment by present and future generations. Maintain a place for low-impact recreation where the public can enjoy the solitude of nature, commune with wildlife, and gain an understanding of local history. Provide educational programs and opportunities for all people. Provide a community and regional gathering place. Potawatomi Wildlife Park is owned and managed by Potawatomi Park, Inc., a not-for-profit private foundation. This Private foundation is an outgrowth of the proceeds from the estate of Vernon Romine. Mr. Romine envisioned a park conveyed exclusivly for charitable, educational and recreational purposes. The park was to be for the use and benefit of the public and especially for the use and benefit of the poor, underprivileged, physically handicapped and mentally handicapped. 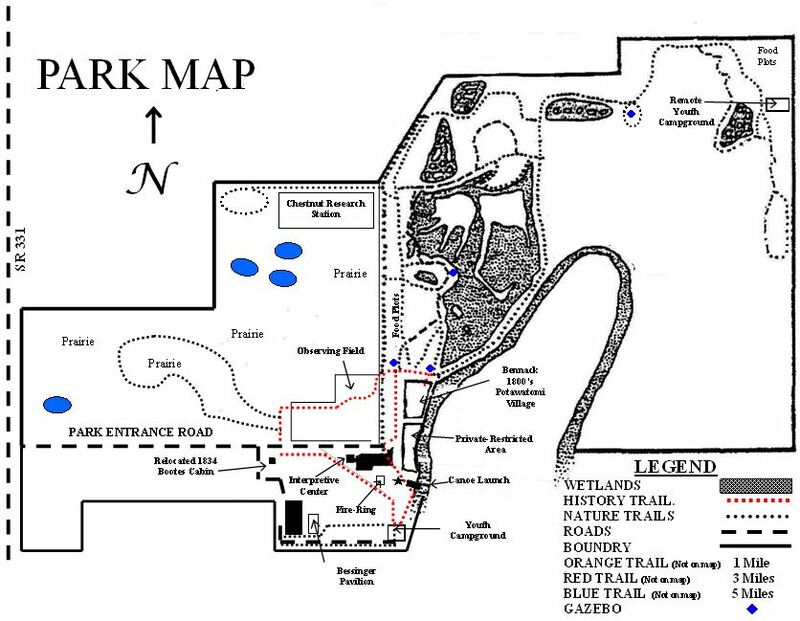 Having grown from its orignal established size of 151 acres, Potawatomi Wildlife Park is now a 317-acre complex that consists of fields, woodlands, ponds, and wetlands and is bordered by the Tippecanoe River. 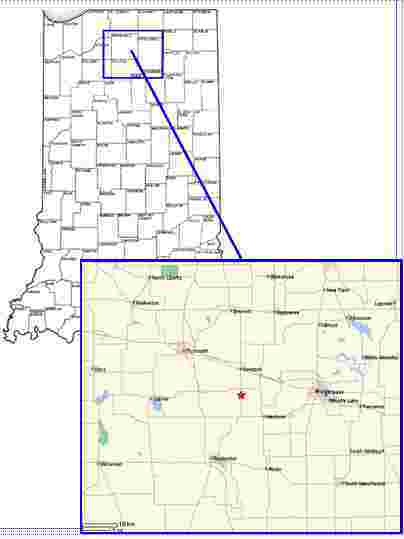 the Park is located on State Road 331 in Marshall County, Indiana. Potawatomi Wildlife Park is managed as a natural sanctuary for plants and animals of northern Indiana and provides educational activities for schools in the area, as well as a site for recreational activities, such as hiking or bird watching. Potawatomi Wildlife Park preserves both a prehistorical and historical site of significance to the regions past. The Park preserves both prehistorical and historical indian encampments, the Stephen Bennack Potawatomi village, a portion of the Goshen-Logansport trail, and the Tippecanoe River ford where several early indian trails crossed the river. 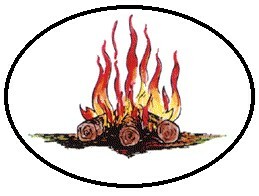 The Name "Potawatomi" and the present Potawatomi Park fire logo (Figure 1.) is utilized with written permission obtained from the Citizen Band Potawatomi Indian Tribe (Shawnee, OK) during the parks formation. The fire is a well known symbol of the Potawatomi Indian Nation known as "Keepers of the fire" or "People of the Place of the Fire". To the park, the fire symbol represents the historical significance of the Stephen Bennack Village site that Potawatomi Wildlife Park preserves. Many sources refer to Stephen Bennack as "Chief". Others refer Bennack as a "headman" which is the head or "leader" of a tribe or clan. The Potawatomi term is "Wkama" which they translate more generally as "leader." The Bennack village is one of only a few "post-removal villages" that existed and it therefore holds an important key to the lifestyle of those who remained here after the removal period. Members of the Bennack Village eventually dispersed. Some traveled west to the join the Citizen (Mission) and Prairie Bands in Kansas and Oklahoma, while others remained in Indiana and assimilated among the American settlers. Stephen Bennack is buried @ Notre Dame Cemetary along with his family. Coming from the north, the Park entrance is located approximately 1/2 mile south of State Road 10 directly across from 17th Road. Coming from the south, the entrance is approximately 1/2 mile north of the Tippecanoe Bridge on State Road 331. Group visits to the park are by appointment only. Arrangements can be made by calling first. All park facilities are available by reservation only. Call to reserve. No visitors shall proceed past the reception area without signing the visitor registration. No vehicles are allowed past the reception area. Do not pick, damage, or injure any structure, tree, flower, plant, bird or wild animal within the park. Leaf collecting for educational purposes is allowed. All firearms, archery equipment, or other weapons must be unloaded and locked in a vehicle while visiting the park. Dogs must remain on leash. No other pets allowed. Drinking water should only be taken from hydrants and fountains for that purpose. Smoking is allowed in the reception area only. No smoking on trails. Put all trash and litter in its proper place. No mushroom hunting is allowed in the park. No arrowhead or other artifact hunting is allowed in the park. No fishing or camping is allowed on park property except for those organized youth groups granted permission. No rehabilitated animals may be released without first contacting the management for permission. There is no charge to visit the park for individuals. However, your contributions help us meet operating expenses and are greatly appreciated. They also qualify as tax deductible charitable contributions. Some special activities or facilities will require a small fee. Call or write for specific information.